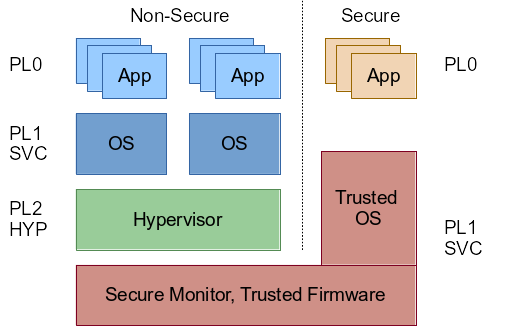 To understand how to switch into Hypervisor mode, one needs to understand the whole privilege level architecture first. Notable here is that on ARMv7 CPU’s the HYP mode is only available in non-secure mode, by design. 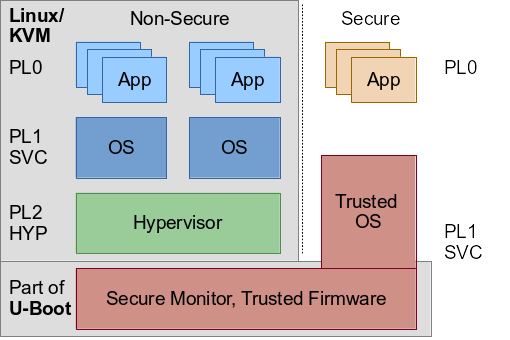 Any hypervisor needs to operate in non-secure mode, there is no virtualization extension in secure mode. SMP: Total of 2 processors activated (96.00 BogoMIPS). The PSCI configuration option causes U-Boot to add a node device tree specifying the location of the PSCI firmware implementation. Currently, U-Boot supports the PSCI interface v0.1, but there are already patches to support interface v1.0. U-Boot allows to use the environment variable bootm_boot_mode to choose which mode the operating system should get started. By setting the variable to sec, U-Boot makes sure to boot it in secure mode (hence not installing the provided secure monitor). I did not found direct evidence whether the CPU is in secure or non-secure mode in the Linux kernel boot log. However, the PSCI messages were missing (since PSCI needs a secure monitor), and subsequently the kernel was not able to start the secondary CPU cores anymore. As mentioned before, even though the CPU is in the highest privileged state, Linux is not able to switch to the hypervisor mode by itself. SMP: Total of 1 processors activated (48.00 BogoMIPS). When using sec, this returns 0 for all bits including the NS (Non Secure) bit, which means the CPU is in secure mode. But when using nonsec to boot in non-secure mode, this read crashes the kernel since accessing the register requires the CPU to be in secure mode. Since U-Boot already provides all necessary configuration and the i.MX 7 configuration already makes use of the secure monitor/PSCI, it turned out to be rather simple to enable the hypervisor mode: Just by adding the additional configuration option CONFIG_ARMV7_VIRT U-Boot made sure that it not only switches to non-secure mode but also enables the Hypervisor mode (this patch makes the configuration option available through Kconfig). Yay! In a second post I will talk about more about how to use KVM on ARMv7, stay tuned!